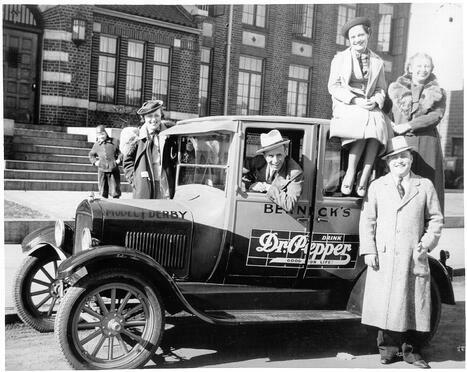 In April, Bernick’s celebrates our 100 year anniversary as a family-run business. Founder’s Day is officially April 26; it was on this date a century ago Charles A. Bernick and his wife Elizabeth purchased Granite City Bottling Works. The inventory was meager; a bottle filling and capping machine, 200 wooden cases of empty bottles, and jugs and crocks of flavor concentrate. Yet, the Bernick family made it into a business, carbonating soda one bottle at a time, and distributing it within a 30-mile radius. With a horse and buggy. While so much has changed in those 100 years, the basic principle remains: distributing great products to the community, lead by the fourth and fifth generations of the Bernick family. It’s all about the people. We have always been focused on people. What do you think prompted Charles and Elizabeth to buy the bottling company when they had only themselves and their children as employees? It was those people in the community who wanted soda and became some of Bernick’s very first customers and employees. From there, the company naturally began to expand. Horses were replaced by Model T’s, soda gave way to include beer, acquisitions occurred, and more and more people were served by the company. The loyalty of our customers and Team Members have led to everything else – all the innovation, expansions, and business successes. Bernick’s positioned the company’s mission, vision, and values around people, and how best to serve them. Remaining true to that business model, of honoring and maintaining the relationships we’ve made, will continue to light the way for the future of our company. There’s more to business than being a visible company or brand. One of the richest assets a company can have is a vital, well-supported community. Our founders began this company based on people and serving their needs well, and that extends beyond beverage needs. We created the Bernick Family Foundation to honor our roots and give even more support to our mission. We have two key areas we focus our support on, in varying ways. They include youth and education, along with health and fitness. We’re committed to ensuring the communities in which we work and serve are strong for tomorrow, while celebrating healthy choices today. Our funding may go toward capital projects, new or expanded programs, investment in operations, school donations, scholarships, and toward environmental and alcohol responsibility leadership. We’re proud to be considered a steady, supportive cornerstone of our communities, and when we’re called upon, we’re ready to rally. What's a milestone of this grandeur without a little celebration? In our case, we want to invite you all to the party. And in lieu of gifts, we’re giving away $100 grand! Our promotion 100 Years, 100 Grand gives us a chance to call on our partners. In addition to the work we’ll continue to do in the name of the Bernick Family Foundation, this promotion is special. We partner with some pretty great people, who have their own passions regarding philanthropy. We want to support their favorite charities or non-profits in honor of our 100 years. So, we’re asking our partners to nominate their organizations and donate $500 in their name. In doing so, Bernick’s will match the donation of the charity or non-profit chosen. We’re aiming to fund 100 separate organizations or causes across our communities. Please complete an online submission by May 31st, 2016 for Bernick’s consideration. Together, we know we can make an amazing impact where people need it most. We can’t think of a better birthday gift than that.